A new Battlefield is on the way this year and we're getting more info on Friday so EA is suitably getting into the spirit of things by handing out free DLC for Battlefield 4 and Battlefield Hardline. 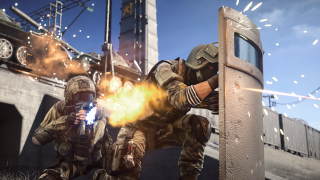 As part of what it's calling 'The Road to Battlefield' promo, EA is kicking off a season of freebies, starting with Battlefield 4's Dragon's Teeth DLC. Dragon's Teeth comes with four maps designed for urban combat across highrise buildings and parks, a new game mode called Chain Link, and a shiny extra gadget known as the R.A.W.R which is basically a remote control car armed with a machine gun and a grenade launcher. It's also the noise that I make when I'm pretending to be a dragon. *Ahem. * And this is just the first of a number of free downloads. "Over the next few months we'll be giving away previously released expansion packs for both games to anyone playing on Xbox One, Xbox 360, Origin for PC, PlayStation 4, and PlayStation 3. There are also new Community Missions and a whole lot more to get excited about," says the news post on Battlefield's official site. We'll keep you updated on all Battlefield developments with the lead up to Friday's big reveal.